Game play: The game is mouse controlled. There are 10 save game slots and can be rewritten on. Save often because the game can end if wrong choice is selected. Right clicking on the mouse shows the Interaction bar at the bottom of the main game screen. At the extreme left is the white circle view icon that you can use to look at some items in close up, ex. letters. Under that is the gold icon to get to the Main menu. At the center of the bar shows the inventory frames. To the right of inventory is the Documentation icon and at the extreme right is the diary that lists important actions already performed. Above the diary is the dress icon that can change the outfit of Faverolles. During game play, click mouth icon once to get the attention of the person and then click mouth icon again to talk to them. Exiting an area or a puzzle is not possible unless the puzzle is solved or all actions needed to be performed in that area is done. You play as Charles-Louis Faverolles. France in 1700: The Court is involved in the succession to the throne of Spain since Charles II is ailing and has no heir. Both France and the Empire hope that one of their own will be named - Duc d'Anjou, Louis XIV's grandson or Archduke Leopold I of Hapsburg. Charles-Louis Faverolles comes back to Versailles after being a page at Grand Ecuries under Monsieur Boisseuilh and advanced school, in hopes of becoming a diplomat to Spain. He yearns to be reunited with Elvira, his childhood sweetheart. Faverolles walks toward the Grandes Ecuries and smiles at a mysterious Lady inside a carriage. Looking for Boisseuilh at Grandes Ecuries: Move forward pass the group of men towards Golipeau, the groom and talk to him by clicking the mouth icon 2x, first to catch his attention and then to talk to him. He informs that Monsieur de Boisseuilh is not there at the moment and recommends the Pelican Inn close to the Grand Commun for lodging. Go back to the arched entry and click on a Map icon (map exit). Click on Grand Commun on the map. Getting Lodging at Grand Commun: Approach the nearest man in blue and talk to him. Enter the brown door of the Pelican Inn to your left. Talk to the innkeeper, the man in white hat. He wants you to get rid of the singing drunk musician before he can talk to you. Go out of the inn and look for a guard to help you with the drunkard. After checking all the men, the guard is the farthest man close to the carriage (a map exit is near here). Watch the guard dispose of the drunk. The best room in the inn is 50 livres and you only have 40. Give the bag of money in the inventory to the innkeeper. He takes the 35 livres and will wait impatiently for the rest. Exit the inn, turn right, forward and left to go back to the Grandes Ecuries using the map (another map exit). Finally meeting Boisseuilh at Grandes Ecuries: Move forward and eavesdrop on the 2 men talking on the ground. The Duc d'Arcueil and Sinzendorf, the Emperor's envoy are discussing the health of the Spanish King and the certain upheaval if Spain is passed to a French or German Prince. Enter the building and now eavesdrop on Boisseuilh and Marquis de Dangeau. They discussed the thefts of saddles and a diamond buckle of the Dauphin. Take the Letter for Boisseuilh from your father from inventory and give it to him. He states that since you want to be a diplomat you have to be known to Marquis de Torcy, the Foreign Affairs Minister. Bringing a saddle back to Torcy might do that. If Torcy is busy give it to Blonderel, the head clerk. On the way out of the stables, pass Duc d'Arcueil listening to the conversation. Approach and talk to Golipeau, the groom. Get the saddle and place it in inventory. Go to the map exit and click on Minister's Wing. A taste of court life at Minister's Wing: A man sitting of the bench offers advice on offering the usher 1 ecu (3 livres) to be able talk to the Marquis. Turn right and approach the usher alone by the door. He states that the Minister and Blonderel are busy. Give the purse to him and now you only have 2 livres. Give the saddle to Blonderel. You ask for a position in foreign affairs, specifically Spain. On the way out, the sitting man again advices that one might meet a person of influence by attending the Grand Couvert, a dinner open to the public with the king and other royalties. Getting ready for the Grand Couvert at the Pelican Inn: In the room at the inn, get ready for the Grand Couvert - hair well groomed, with hat and sword. Pick up the hat on the chair, gloves on the table and sword on the bed. Place them in inventory. Click on Faverolles' Dress icon at the bottom right of screen. Get hat from inventory and click it on his head. The gloves goes on his right hand and the sword on his left hand. Now you are ready and can get out of the room. Go to the hallway, turn right and go down to the dining area of the inn. Talk to the innkeeper that is forever wiping tables. Approach and talk to Lhuillier, the man in brown eating beside the innkeeper. He states that to get in the Grand Couvert one needs a recommendation. He is assistant building inspector to Mansart, the architect and might get a position for you tomorrow if you pass the test. 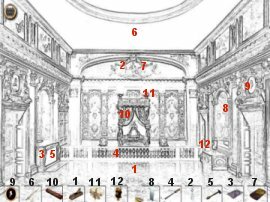 Trade Order puzzle - The test is to arrange the order the different trades who do the work in refitting the new King's chamber. You can read about the Chamber of the King at documentation. The different trades are at the bottom of the screen. Click on a trade. Then click the trade icon on a part of the room connected to that kind of work and in prioritized order. Icons light up when placed on correct spots. If an incorrect icon is picked up, no place to set it down will be located. One arrangement is as follows: (trades 1-5 can be interchanged) 1. Carpenter - center of room floor, 2. Plasterer - ornate decoration on wall above the bed, 3. Marbler - left dressing area, 4. Wood sculptor - front railing, 5. Bronze worker - same as marbler at left dressing area, 6. Painter - ceiling, 7. Gilder - same as plasterer at ornate decoration on wall above the bed, 8. Mirror cutter - on either side dressing area, 9. Painting guard - picture above the right door, 10. Tapestry maker - curtain of the bed, 11. Fleecer - on either vase like object on top of the bed canopy, 12. Clockmaker - clock on right dressing table. After passing the test, an appointment is made to meet Mansart tomorrow at 9 AM by the statue of Proserpine at the Colonnade. A guard walks in and Lhuillier hands you a diamond and rushes out in a panic. Interesting! Teetotum game: On the way out, talk to the gambler on the left. He issues an invitation to play teetotum using the diamond as security. The object of the game is to bet on a number that will match the numbers shown by a spun top. Select a number and the diamond will be placed at the bottom of that number. Click on your bet/diamond and the bet of the opponent appears. Then click on the top icon and click again to make it spin. When it stops, the top will show the winning number. Winner takes all. After the first game, the diamond is lost to the gambler. Go back and talk to the innkeeper thus ending the day. Meeting Lhuiller at the Colonnade: The next morning at the Colonnade, eavesdrop on 2 men (Mansart, the architect in brown and Dupuis, the gardener) discussing the gardens. There is a statue in the background ready to be placed on a pedestal - Abduction of Proserpine by Pluto. They turn to you for an "impartial" opinion on the Ballroom (garden designed by Le Norte) and the Colonnade (designed by Mansart). Better choose the one by the possible employer, eh! Select Colonnade from bottom left of screen. Lhuillier introduces you as possible assistant to him and Mansart is in agreement. Mansart wants you to take Marquis Castel dos Rios, the Spanish Ambassador around the garden. Talk to Lhuillier. He gives you an advance in salary of 80 livres for July. If you chose the Ballroom in the previous "impartial" test, Mansart will not be so predisposed to you and Lhuillier will only give you a salary of 40 livres. Another lesson in politics!! A talk with the Spanish Ambassador is seen. Lhuillier gives you instructions, list of groves (both not accessible to be read) and key to the groves. Tour of the groves with the Spanish Ambassador: During the tour, the ambassador asks questions. On the first stop on the King's Terrace overlooking the North Gardens, he asks the name of the road - select La Tapis vert. Next question is what direction is this tremendous view? East-West. They then visit the Orangery, designed by Le Notre and then the Ballroom grove. Talk to the Ambassador. At the Colonnade, the Ambassador discusses the situation about the succession of ailing Charles II and the political situation. He is worried about the involvement of a Countess of Perlitz. Next stop is the Encelade named after a giant that attempted to dethrone Jupiter and was crushed under an avalanche. The fountain is designed to show that scene. Talk to the Ambassador again. Turn around, walk forward and turn left to an alcove with a lady sitting on the bench, the same mysterious lady from the carriage. Talk to the Ambassador again and he will give another test. Apollo Sculptures Test - Select the sculptures that show Apollo. The pictures shown in order are Apollo's Chariot, Abduction of Proserpine by Pluto (NOT an Apollo sculpture), Apollo as a child with his mother, Latone and Apollo waited on by the nymphs. At the next stop, talk to the Ambassador again. He says that this grove is Arbre en fer grove, also known as Marais or Chen vert grove. Turn around, go forward, talk to the Ambassador again. Another question - How many groves are there? Fourteen. Return to castle, it is already 5 o' clock. The Ambassador knows of your love, Elvira Malaga y Santiago and have decided to help you. The King and his entourage including the Duc d'Anjou, grandson of the King is out to take the King's walk. Back at Pelican Inn to get the diamond back: Lhuillier is worried and Faverolle decides to visit him. Before doing so, better get the diamond back from the gambler. Go to the Pelican Inn and play with the gambler for the diamond. Choose a number, raise or lower stake by the arrows on the side, click on your bet to show the opponent's stake, click on the top 2x. Continue until you win the diamond back. Pay the innkeeper the money owed him by clicking the coins on him. Visit Lhuillier at Grand Commun: Exit inn, turn left, up the stairs and through the door. See the usher that stops people from getting in the Grand Couvert without a recommendation. Turn left through the hallway and see a guard posted on the stairs. Turn left, go to the kitchen, turn right and talk to an enterprising kitchen helper. Lhuillier is under arrest in his room. Now to find a way to get to see him. The helper said that Lhuillier's dinner is ready. Turn around and go to the other side of the tables. Pick up apron from table by the wall. Click on Faverolles dress icon on bottom right of interface bar, select apron from inventory, click it on Faverolles and exit dress icon. Turn to the right and pick up Lhuillier's dinner. Go back and talk to the provost guard by the stairs. Go up, talk to the next guard, enter room and place dinner on table. Lhuillier asks if you have the pass (diamond) - answer Yes or No. If no, game ends. If yes, Lhuillier states that you must give the diamond back to the Dauphin or one of his sons. Go back down the stairs and meet the kitchen helper. He states that the Dauphin is in Meudon with 2 of his sons and only the Duc d'Anjou is in Versailles. In search of Duc d'Anjou: Go out and leave Grand Commun by the map exit on either end of the area. At the map, there are several places to look for the King's grandson who is out with the king on his walk. The King is at Encelade as stated by the guard at the Ballroom grove, by the hydraulics engineer at Colonnade and by the resting gardener at Marais. On to Encelade. At Encelade, ask the Spanish Ambassador or Sinzendorf standing by the fountain about the Duc. Other personages around will say the same thing but the guard won't let you near them. By the arbor (turn left to the alcove from the guard), the Duc d'Arcueil states that the Spanish Ambassador might be the one to give the diamond to the Duc d'Anjou since he is out of favor at the moment. Give the diamond to the Spanish Ambassador. The downfall of Lhuillier is shown after his theft of the Buckle diamond. He was spared but was dismissed. Faverolles was given his position. Intrigue in the War Room: After a walk through the Hall of mirrors and entering the War Room, eavesdrop on the Minister Torcy and Dangeau on the left. They talk about the ailing Spanish King and partition of the succession. Turn around and talk to the 2 nobles by the corner windows, Duc d'Arcueil and the scientist, de Bandols in brown. The Duc, he being a friend of de Torcy can help in your ambition to be a diplomat but he wants you to show de Bandols the secret of the fountains, in discrete fashion of course. de Bandols wants the plans for the hydraulic network that bring water to Versailles and distribute it around the gardens. Go to the map exit by the entrance to the war room. Search for information about the water system: At the Colonnade, talk to the hydraulic engineer but he can't help because they are all too busy and short-handed. Map exit. At the Ballroom grove, the gate is closed. Use the key to the groves on the gate and enter. Forward, left, forward 2x to the mosaic walkway, turn right, up the stairs and talk the gardener with the shears. His master, Dupuis might be able to help. Now to find him. At Encelade, the raker also tells that Master Dupuis who is at Marais can help. Go to Marais and talk to Master Dupuis in brown and lime green coat. He is putting out the citrus trees but an accident calls him away. He asks you to take over in the arrangement of the trees and he will give you the plans later. Citrus Trees puzzle - there are 3 trees already in place. The sequence of placement is Lemon tree, Orange tree and Pomegranate tree. The trees to be placed are at the bottom center of the screen (L-R: 9 Lemon, 9 Pomegranate, 9 Orange). 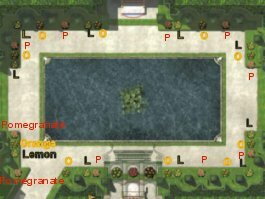 Click on a tree and click on a space (ill-defined shrub) around the garden to place it at that spot. Starting at the bottom left where there is already a Pomegranate tree, place Lemon, then Orange and then Pomegranate trees around the walls in a clockwise manner. Dupuis approved of your work and will bring the documents to the apartment at Grand Commun. Studying the information on the water system at Grand Commun: Click on the document on the table, picking up a letter. Then click the letter on the circle on bottom left of the screen. Click on letter for translation. Water System Plans Puzzle - Dupuis asks that the documents be placed in the right order before studying them. The information on this can be found on documentation under The Court in its garden (second from left picture on top of frame) Water and Fountain (Search water, supply, distribution, turning on). Pick up the folder on the table and see a set of documents on the left and 3 folders on the right. The object of the puzzle is to sort the documents by a common subject and then place them on the folders on the right. The folders have to be in sequence of usage in the water system. Click the documents on the left and place them in the box at the bottom to find out the title of each document. Then click the documents on the folders by common topic. Top folder for search water and supply - Eure Aqueduct, Plan of water mill, Marlys machine, External network. Middle folder for distribution - Internal network, gravitation, pipe distribution. Bottom folder for turning on - Nozzles and jets, Ajutage apples. Go out the room, open the door and talk to de Bandols. He wants to be able to introduce water himself to a grove. He will be at the Colonnade tomorrow morning at 10. Now they will study the documents. Go downstairs and talk to the enterprising kitchen helper, Le Perdrix who wants to be your valet. Go to the Colonnade. de Bandols' study of the water system at the Colonnade: Talk to de Bandols and he wants equipments. Talk to Tiquet, the hydraulics engineer at the fountain by the gate and borrow his equipment. He gives you the clef-lyre and whistle as well as a Pall Mall mallet. Talk to de Bandols. He wants to introduce water to the fountain and you will change the water pressure outside the gate using the Lyre key. Give de Bandols the whistle and exit the gate. Water fountains puzzle - The object of this memory puzzle is to follow the pattern of de Bandol's whistles. When de Bandols whistle once, shown by a circle on the bar at the bottom of the screen, increase the water pressure by clicking on the tip of the lyre key (clockwise turn). 2 whistles shown by an elongated circle means decrease the water pressure by clicking on tip of the other end of the lyre key (counterclockwise turn). Best to remember which end of the Lyre increases and which end decreases when the whistle pattern gets complicated. When you successfully do the puzzle and before the last turn of the lyre key occurs, Dupuis arrives and gives a scolding. Thinking that the de Bandol's learning will be against Mansart (not to boast of perpetual motion) appeases Dupuis. Talk to de Bandols. Search for owner of mallet at Pall Mall area: Use map exit and go to the Pall Mall alley to give the mallet with royal insignia to the owner. Talk to the Spanish Ambassador about the passport. He wants to meet at 5 PM in Marais. While talking about sensitive political topics, that same mysterious Lady passes close by. Turn left, forward, left and talk to the guard of Duc d'Anjou. Go to the other 2 Princes and find out if mallet is theirs. Go back to the Duc d'Anjou and give him the mallet. He asks that you fetch the mysterious lady's ball. Turn right and go close to the wall by the wooden turret/tower. Look down and pick up the dark brown ball (Ball 1) at the center of the group of balls. Give the ball to the mysterious lady in green, Prosperine. She gives a letter and wants to meet you at the Ballroom grove at 5 PM to talk about the secret she overheard at Madam de Maintenon's place. Read the letter from Prosperine. Interesting! Turn around and talk to the just mentioned Duc d'Arcueil, who issues an invitation for a game of Lansquenet at Encelade this afternoon. Full appointment schedule!! Hmmm, both Prosperine and Duc d'Arcueil have been around during unexpected times. Use map exit to go to the apartment at Grand Communs. Keeping all the appointments made: At Grand Communs, Le Perdrix, the new valet says that his brother is a Hydraulics engineer. He does have a problem with word usage! Go up to the apartment and Le Perdrix gives you dinner as well as letters delivered by Boisseuilh. The clock strikes 3. Turn around. Pick up and read the 3 letters from Elvira from the bed. They concern about her love, the political situation in Spain and a warning about Comtesse de Perlitz and the treaty. Appointment with Duc d'Arcueil and Lansquenet game: Go to Encelade, enter, turn left, forward, left and go to the arbor. Talk to the standing Duc d'Arcueil and he asks that you take his place and win to cancel his debts. Lansquenet game: The game of Lansquenet is based on the first player to draw a card that match the number and color of the face card in front of the player, ex. a face card of 2 of hearts will win with a 2 of diamonds drawn. Click on the money at the bottom right of the screen to bet, use arrows to increase or decrease the amount of stake. Then click on the coins to show the other stakes. The winning card for each face cards around the table is shown at the center by moving the pointer to each face card. Click on the stack of cards beside the dealer's face card on top of the screen to draw your card. After each round (only you get to see your drawn card) repeat the whole procedure over - bet, click bet, draw card. You will win in the end and recover Duc d'Arcueil's debts and save him from ruin. He warns about acquiring Madame de Maintenon's displeasure concerning Prosperine marital future. He states that de Bandols want to visit the underground tunnels. Go to map exit and click on Marais. Appointment with Spanish Ambassador: At Marais go forward, right, forward and talk to the Spanish ambassador in front of the organ like fountain. He states that the King Louis had promised the Spanish King that nobody from his court enter Spain. You are a King's officer and thus cannot be given the passport. Go to the map exit and click on the Ballroom grove for the next appointment. Appointment with Prosperine: 3 Ladies including Prosperine enter the Ballroom and the gates are locked. Go forward and find out that key to the groves do not work. Talk to the musician in blue standing on the left side of the gate. He can get Prosperine's attention by playing her favorite music. Now, to get a sheet of music and the title of her favorite tune. Remember the drunken musician! Go to map exit and click on Grand Communs and then enter the Pelican Inn. Talk to the man with the trumpet and he will charge 2 livres per copy of the sheet of music to be played. Pick one up and give it to him (the correct music sheet is in the right foreground). The music is Lully's Ceremonie Turque. Go back to the Ballroom grove. Talk to the musician again. He plays the music and Prosperine arrives, gives you a sealed letter to read at home alone and to be burned afterwards. Opening the sealed letter at the room at Grand Commun: Go to your room at Grand Commun. Read the note with broken seal. Oh! The King signed a secret treaty to divide the Spanish kingdoms with England and Holland. Pick up the lighter from the table. Now that the letter is read - Keep it or Destroy it? If you do not burn the letter - game will end later in the game play. Choose Destroy it. The next morning, a knock on door is heard. Open the door to see de Bandols. 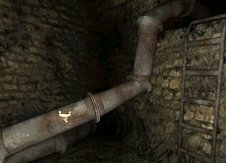 He wants to examine the pipe works in the underground tunnel. He needs his measuring equipments from his room at the Pelican Inn and he gives you the key. The key to the underground tunnel is also needed. Then meet de Bandols at the clearing behind the Marais grove. Go downstairs and talk to your trusty valet, Le Perdrix. He will take care of getting the key to the underground tunnel. de Bandols' Equipment: Go to the Pelican Inn and will be stopped by the innkeeper. Show him de Bandols' key. Talk to him again. Go up the stairs, left, forward 2x, right, through door, left and use key on door. Enter. Open the chest by the window and pick up spirit level. Turn around and pick up spring-adjusting caliper from the floor beside the bed. Exit room and go see Le Perdrix in the kitchen. In search of the message at the kitchen at Grand Communs: Walk towards the man turning the spit. Turn to the right and talk to the sitting woman. She said that a Swiss guard from Bontemp was there looking for you and that Le Perdrix hid a message before escaping. Search the kitchen for the message. It could be in a cup on the table, pots on the shelves or grinder on the floor by the window. The message is in a pot on a shelf under the table close to the door. Read the message. Key - removal of Prosperine. Now what does that mean? Aha! Abduction (removal) of Proserpine (Prosperine). Le Perdrix surely has a certain way with words. On to the Colonnade where the statue - Abduction of Proserpine by Pluto was seen. If you want to look for Prosperine, check with the gardener, trimming the hedge at the edge of the Ballroom grove. He will say that she might be at her toilette or at mass with the King. Then go to the Queen's staircase. Go up the stairs, left on the landing and enter the room. Talk to Prosperine and she will get you back on track to the Colonnade. Search for key at the Colonnade: Upon reaching the Colonnade, go forward towards the statue once, look down and pick up the key to the underground tunnels. Now go to the Marais grove. Underground tunnel at Marais: Talk to the gardener raking and find out that le Bandols entered the clearing on the right after the iron gate. Turn right, enter the arched entryway and turn left. Give the room key back to le Bandols. An impatient and loud de Bandols wants you to measure the pipe diameters using the spring-adjusting caliper and check the gradients with the spirit level. Turn right to the iron gate. Pick up the lantern on the ground by the right ivy covered wall. Click the lighter on the lantern. Click lantern on iron door. Exploring the Underground Tunnel - Forward once and a left and right tunnel is seen. Go to the left tunnel and see another tunnel ahead and an iron-gated tunnel on the left. Go forward 2x. A split of left and right tunnels is seen. 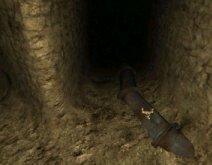 Look down facing the right tunnel and see a pipe. Use spirit level on it. (A hand icon is seen when placed over a pipe to be measured and when the measurement is successfully done, another hand icon is shown). Enter the right (with pipe) tunnel and see a rectangular opening ahead. Look down and see 2 pipes on either side. Use the spring-adjusting caliper on the left pipe. Enter the rectangular opening. See a pipe ahead. Use spirit level on it. But before you could do anything a Swiss guard comes in looking for you and You had to climb the ladder to hide. On the way down, the ladder gave way and water rushes into the tunnel. Go forward, turn left, forward, turn right and climb the metal rungs. Talk to the Swiss guard. He wants you to empty your pocket for the letter Prosperine has given you. If you burned the sealed letter, the only letter in inventory from Prosperine is the first one given at the Pall Mall alley. If you did not burn the compromising sealed letter, the game ends. Give the guard the Letter from Prosperine from the inventory. Whew!!! Where did de Bandols go? Must have been frightened by the guard. Talk to Duc d'Arcueil and explain to him what happened. He is now in good standing with the King due to your actions with de Bandols. As a repayment, he will introduce you to Minister Torcy just now coming out of a meeting. Meeting Minister Torcy at the Queen's staircase: Climb stairs and see Minister Torcy at the landing. Duc d'Arcueil introduces you to the minister. Talk to Minister Torcy. He gives you a heated coded letter for you to decipher. Deciphering the coded letter - To decipher the code, look for a pattern between the numbers in a set. Each set of numbers has a different pattern from the other set of numbers. Place the answer on the squares on the right by clicking at the center of each square. Clicking the reversed check mark beside the squares will erase the numbers entered on the squares if the answer is wrong or show the coded message on the right side of the page if the answer entered is correct. Minister Torcy is impressed but he does not know who P is. You state that it might be Comtesse de Perlitz and asks to be the one to intercept the Lady at Bondy. You are to go to the Grandes Ecurie, ask Boisseuilh for the best horse and directions to the stage posts. Torcy will send the imprisonment order to the Ecurie as soon as it is drawn up. Arrangements to be done at Grandes Ecuries to Stop Countess Perlitz: Go to Grandes Ecuries. Boisseuilh states that all the men in Ecurie are in the King's service and thus in yours. Turn around and talk to Golipeau, the groom combing the horse. He said that the best horse is next to the wagon. Turn to the right, forward and talk to a short ?man in blue. He says that the best horse is the racer with the white muzzle. Go towards the 3 horses by the door and turn right to the man reading a parchment. Talk to the man. He said the English racers with the short hair is the best horse and that he will also prepare your stages (directions to the stage posts). Go back to talk to Boisseuilh and he will give you the sealed order. Turn to the 3 horses. Now which horse? The horse closest to the door is also closest to the cart as well as having the shortest tail (cannot see the muzzle). Caparison the horse closest to the door. Caparisoning the horse: The icons in the box on top right are the different equipages to get the horse ready. 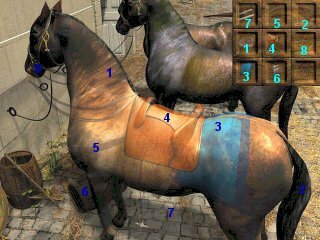 Place the different items in order of priority to the different areas of the horse. The icons light up when placed on the correct area. After placing the different items on the horse, click on the hitching ring or bridle bit to exit the frame. If done correctly, a cut scene will come up. If not done right, the game ends. The game ends when the wrong horse is chosen or when the sealed order is not taken from Boisseuilh before caparisoning the horse. (In my game, it took a while and several clicks on the hitching ring before the cut scene or game end message comes up - so just keep on clicking. Clicking on the bridle, stirrup or saddle also can get an end to the scene). You inform Minister Torcy that the sealed order was delivered. The King comes out and with an entourage of pages, courtiers and guards. Minister Torcy introduces you to the King. The King gives you the instance of Our satisfaction. From then on, you are now of the court not just at the court as part of the King's group. The King keeps you in His presence in all functions of the court and gives you tasks concerning Spain. The German Emperor could not bring himself to sign the treaty, thinking that his son will be named heir. You are now a Gentleman of Chamber. The King now confides in you and gives you missions directly. Your life revolves around the King. Spanish line of Succession: You find yourself at a table at the Dining Room used for the Grand Couvert that was off limits before. A man of the Court talks about a rumor that the King laughed at the idea that Duc d'Anjou is in line for the Spanish succession. You tried to correct him but were derided by being a young upstart who knows more than those that have been serving the court for more than 20 years. He will not let you go until you prove what you said. Proving that Duc d'Anjou is in line for the Spanish throne - The answer can be found in documentation under Europe in 1700, then Line of Succession. First, place the "crowns" on known royalty that are not in line for the succession. These are the known reigning royalties and their heirs. Then fill the empty frames with the pictures of those in line for succession. 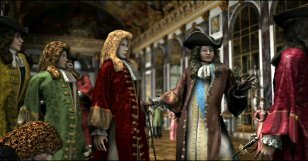 The ones not in line for succession (crowns) for France are Louis XIV, the reigning King; Louis or de Monseigneur le Dauphin and Louis Duc de Bourgogne, the first grandson. For Spain, Charles II is the reigning King but has no heirs. For the Empire: Leopold I, Emperor of Germany and Archduke Joseph, his heir. 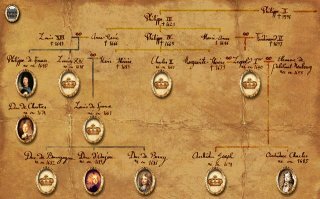 The ones in line for succession (pictures) for France are Philip d'Orleans or Monsieur, the king's brother; Duc de Chartres, Monsieur's son; Philippe Duc d'Anjou and Charles Duc de Berry are the King's grandson. For the Empire is Archduke Charles, the younger son of the Emperor. Exit the room. Le Perdrix informs you that Duc d'Arqueil wants see you at the Small, he means the Mall. 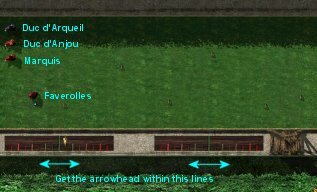 Playing at Pall Mall Alley: Go to the Pall Mall Alley and talk to Duc d'Arqueil. Duc d'Anjou wants you to team with him in a game of Pall Mall against Duc d'Arqueil and Marquis Dangeau at 100 livres per game. Pall Mall - The game is explained in documentation under Rules of the games. The object of the game is to get a hard boxwood ball through various hoops. This is done by hitting it with a mallet and with as few strokes as possible. Each team has their own ball. There are 2 gauges at the bottom of the screen that affects the strike of the ball. Click the mouse to stop the moving arrow as close to the center green line in both gauges. Getting the arrow inside the light green lines on each side of the center green line ensures an accurate hit to the hoops. The hoops to be hit are staggered on the field. After the win, Duc d'Anjou wants to make you part of his team if the king wills it. He also expects you to be at the ball tonight. The Ball: In your room at Grand Communs, click on the outfit on the bed. Exit the room. At the Rocailles grove, the ball is in progress. This is your first attendance at the ball. A courtier in blue courts your favor since you publicly acknowledge the Duc d'Anjou's right for the Spanish succession. Prosperine asks for help. The Comte, the man Madame de Maintenon wants her to marry died. She thinks that she will be sent to St. Cyr. She could not continue her appeal because Madame is watching. Duc d'Arqueil expresses his attraction for Prosperine and asks for you to intercede in his behalf. Duc D'Anjou is delighted to have Faverolle as his champion. During the walk with the Duc, Elvira's picture falls on the ground and a Swiss guard picks it up. The Charge: The next morning, Madame Maintenon shows you Elvira's picture and charge that you are deceiving Prosperine. You have today to bring the proof to Vernhole, the Swiss guard since Madame will be gone to St. Cyr, back at 2 PM and an hour later leave for Marly. By the staircase, the Marquis de Dangeau, Minister de Torcy , Prosperine and the courtier in blue states their opinions about your disgrace. Duc d'Arqueil tells you to use the passport promised to you by the Spanish Ambassador as proof. Marquis de Castel dos Rios can be found in the gardens. The Proof: At Marais, talk to Dupuis, the gardener. He wants you to give the plans for the Trianon to the Spanish Ambassador. The Ambassador is in deep conversation with Sinzendorf and cannot be interrupted. Wait and eavesdrop on the conversation until it is finished. What was said was that Spain is in turmoil, that the important positions are to be given to Spanish men and that Spain might take measure against France. The Ambassador informs the Emperor's envoy that Duc d'Anjou is with the King at the Ecurie. Give the Trianon plan to the Spanish Ambassador. He gives you the Spanish passport. He states that letters from Spain is not getting through. You are aware of this because you have stopped receiving news from Elvira sent through Boisseuilh. He advises for you to find out about the situation from the riders. If you interrupted the conversation of the Spanish Ambassador with the Emperor's envoy. The Ambassador will dismiss you. Leave the gardens and find yourself in the room at Grand Communs. A knock will be heard and upon opening the door, the Spanish ambassador is seen. He explains that he cannot give you the passport in front of the envoy. It does not matter for you have written your resignation, since only the passport can save him. No hope of seeing Elvira or Spain ever again. The passport is given since you need it here. The Ambassador expressed his opinion about the stoppage of letters from Spain and urges you to check with the riders. Check with the riders: Enter the building at Grand Ecuries and talk to a rider about the letters being stopped at the Spanish border. He states that a Dutchman has approached him and asked about the Duc d'Arqueil. He thinks that they are after his letters. He cannot get away from the Duc who is coming in the building at that moment. If you want to hear the rest of the story, he must get away from here. The Duc talks to you about your presence there and you ask why he is not at Marly. Go out the stables, turn right, right again after the horses and see a rope attached to a ring on the wall. The rope is holding a sack of hay. Untie/click the rope. The horses get frightened and start neighing. The rider comes out to calm them and explains the rest of the story - He thinks the Duc is mixed up in this affair but has no proof. The Dutchman is here at Versailles at the Grand Commun. Search for a spy: Search for the Dutchman in the dining area and kitchen at Grand Commun. At the kitchen, talk to the sitting woman. She has not seen a Dutchman. Finding the spy: Go to the Pelican Inn. le Perdrix, noting that you are worried will remain close to your side. Turn to your left and see Vernhole, the Swiss guard standing by the door. Give him the Spanish passport. He says he will be back in 20 minutes. If you miss him now, he will be back and can give the passport later. Talk to the innkeeper and asks about a Dutchman. He says that there is only an Englishman, who spends his time writing, not noticing when his beer is brought up and only goes out to post letters. Sounds of windows breaking are heard. Must get to his room to see what he is writing. Pick up the stone on the floor behind le Pedrix. Go to the table in front of the fireplace and pick up the dinner for the Englishman. Talk to le Pedrix and tell him to go to the Englishman's room, look around and bring back anything he is writing. Since he cannot go empty handed give him the Englishman's dinner. If you missed giving the passport to the Swiss Guard, give it to him now. Back in grace: The Swiss guard returns and gives you a letter from Madame Maintenon. She is convinced of your sincerity but advises that to reach Spain must have 3 more passports - France, England and the Empire's. She will take care of the French. Room of the spy: Talk to le Pedrix. He says that the room is filled with papers, seals, number and letters. He tried to get one but the Englishman got angry and so he left. You ponder on getting a seal of safe conduct (English passport) from the Englishman but needs a distraction. Give the stone to le Pedrix and ask him to throw it on the Englishman's window. Go up the stairs, through the hallway, left and knock on door. Look on the table and pick up the codes. The Englishman gets distracted, pick up the safe conduct (English passport) and again he gets distracted. Pick up the documents and he gets distracted again and asks for a change in room. He realizes that you stole his papers and challenges you with drawn sword. The Swiss guard warns that no fighting is to be done. Wait, do not draw your sword and the guards will try to catch the Englishman but he gets away. In the War room, the King wants you to be here when he gets back from the Chapel, giving you only a half hour. Try to get to Elvira: Talk to Castel dos Rios and he said that his son just got here from Madrid. Elvira has been taken by the German function and the letters to you have been seized. The only one that can help is the Comte Sinzendorf and he can be found at the Marais grove. Turn to the right and talk to Duc d'Arqueil. He gives you the French passport and wants to talk about Prosperine. You said that it is important for you to see the Emperor's envoy right away. He tells you that Sinzendorf asked Torcy for an audience with the King. But Torcy refused because Sinzendorf would not divulge the reason for the audience. Go to Marais. Talk to Sinzendorf, the Emperor's envoy. If you have not talked to Duc d'Arqueil before this the Envoy will not talk to you. Explain to him about Elvira and promise him an audience with the King. He has carte blanche to talk to the King on an extremely important matter. After your errand to the chateau you will talk to Torcy when he arrives for the council meeting. Exit the grove. You walk through the Hall of Mirrors towards the War room again. The King enters with his entourage. The King says that a rider from Madrid is coming and that you should bring him to the king as soon as he arrives. Go to Grand Ecuries. Talk to Golipeau, the groom and Boisseuilh about the rider. Go to map exit. Go to the Queen's staircase. Climb the stairs and talk to Minister Torcy. Inform him that Sinzendorf has full power to sign the division of Spain. Torcy says that he will speak to the King immediately. He also tells you that the Englishman was arrested in the gardens. He wants you to check if he is really your man and then as for our business, to see him at the Minister's wing. Go talk to Sinzendorf at Marais grove. He inquires about his appointment and will be at the Ballroom grove all afternoon. In search of the Imprisoned Englishman: Go to Colonnade. Go forward and talk to the Swiss guard. He states that he cannot tell whether the madman is an Englishman because it is a state secret. Turn left and talk to the hydraulics engineer in brown outfit. He says that the madman wants to throw himself off the turret used to prune the tallest trees. Go to Encelade and ask the raking gardener about the madman. He says that he is too busy for rumors because he has to go to the Mall to prune big trees. Madman at the Pall Mall Alley: Go to Pall Mall alley and talk to the courtier. He tells you his eyewitness account and that the spy is a foreigner. Go to the turret/tower. Pick up the rake leaning at the background amidst all the other tools. Turn left and climb the wooden steps. Turn left and see a message on top of the hedge. Use the rake on the paper. Get down from the turret and go to the map exit. Coded Message: Go to your room at Grand Communs. Click the message from the hedge on the codebook on the table. Read the message - The king is dead and he named the Duc d' Anjou as his heir. Be sure that the message on the hedge is gone and a coded message is in the inventory, if not redo the message and the codebook part again. Talk to le Perdrix. Tell him to Go to the Grand Ecurie, bring the rider to him and that you will be at the Ballroom all afternoon. If you choose the other answer - Go and give this message to Sinzendorf, the game will end. Go to the map exit close to the Pelican Inn. Checking in with Torcy at Minister's Wing: Go to the Minister's wing. Approach Blonderel by the curtained door and he says Torcy is at dinner but he will get him for you. Talk to Torcy about the Envoy's appointment and about the coded message. He says that it is a fake. On the way out of the room, talk to Duc d'Arcueil. He states that the king wants to talk to you before he goes on his hunting trip. At the King's terrace, the King said that he would grant an audience to Sinzendorf and also to tell Torcy. He also asks if the rider has arrived. Informing Sinzendorf of the audience: Go to the Ballroom grove. You see the Duchesse de Bourgogne and Sinzendorf talking. She was trying to get the Envoy to play Blindman's bluff but he was hesitant. You were chosen to take his place. Blindman's bluff - The eyes are blindfolded. Then try to catch a person around you and identify that person. 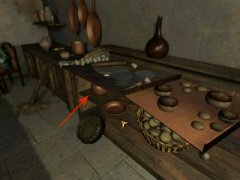 In this game, the blindfold has slits that enable part of the outside to be seen. Aim for Sinzendorf, since you want to talk to him. Look around and notice that Sinzendorf in red is way back of the group. On his right (your left) is the Spanish ambassador in black. Panning to the left and closer is Marquis de Dangeau wearing red. To his left is the Duchesse de Bourgogne. Play blindman's bluff and try to catch and identify the Duchesse de Bourgogne, then Marquis de Dangeau and then the Spanish ambassador and finally Sinzendorf. When you correctly identified each one, the closer to the next person in the background occurs until you are in front of Sinzendorf. When you successfully pick Sinzendorf, the game ends. Go forward 2x to the mosaic walkway, turn right, climb the steps and talk to Sinzendorf. Inform him that the King will meet him at 6 PM. He gives you a letter to be given directly to the German ambassador in Madrid. You now have all the passports needed. Correct the mistake: Go down the steps and talk to Castel dos Rios. He states that the Treaty of Division will be signed and the Imperialist will reign in Madrid. Duc d'Anjou will never be King of Spain. Love triumphs but abandon hope of living in our kingdom. You state that it might be possible to get Sinzendorf to refuse the audience of his own accord. Go back to Sinzendorf. Talk to him. If the spy is indeed an Englishman then the message is not true and that changes everything. How can we get to the truth? You tell him that there is one here that can tell you and us and will see if he has arrived. Go back to the exit of the grove and see le Perdrix. He says that he brought the rider with him. Tell the rider to follow you as you go back to Sinzendorf. Ask the rider to tell the message he carries - The King of Spain is not dead and has not named his successor. Sinzendorf withdraws from the audience with the King. The king announces the betrothal of Duc d'Arqueil to Prosperine. He also grants leave for you to visit Spain and to come back quickly. While you are in Spain, Charles II dies. Later in France, the King presents the new King of Spain, his grandson, Phillip Duc d'Anjou. Castel dos Rios, the Spanish Ambassador is the first to pledge before the new king. His birth destined him to this crown and the late king also through his will. You are told by French King to follow his grandson.